Join The Korey Stringer Institute’s Team Strive 2 Protect to Guarantee Your Entry to the 2019 TCS New York City Marathon! Team Strive 2 Protect runners received guaranteed entry to the 2019 TCS New York City Marathon while raising funds to support the Korey Stringer Institute. The Korey Stringer Institute provides research, education, advocacy and consultation to maximize performance, optimize safety and prevent sudden death for the athlete, warfighter and laborer. You can help further that mission and impact the health and safety of active individuals everywhere by running with Team Strive 2 Protect! One of the services already provided to the public by the Korey Stringer Institute is physiological athlete testing. 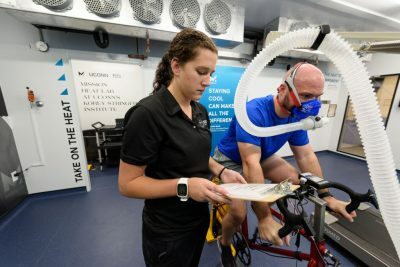 We have a state-of-the-art environmental exercise laboratory, which allows us to precisely control exercise environmental conditions and measure physiological functioning during exercise. Examples of some of the testing we provide to the public are aerobic fitness (VO2max testing), substrate utilization testing, sweat rate and sweat electrolyte analysis, heat tolerance testing, lactate threshold testing, heat acclimatization management and body composition analysis. Consultation on how to best integrate your testing results into your training and racing. We will provide you with a heat acclimatization strategy – this is a proven tactic to improve race performance even in cool weather! We will provide fundraising support, including a personal fundraising page, to help you meet your goal! Lastly, we will offer runners the option to utilize the NYRR Virtual Trainer that will create a personalized 12- or 16- week training plan for each runner based on his or her fitness level and running experience. Team Strive 2 Protect runners commit to fundraising a minimum of $3,000, due in full by 11:59pm on Wednesday, October 2, 2019. In addition to the fundraising pledge, Team Strive 2 Protect runners are responsible for the TCS New York City Marathon race registration fees.